Spare Seal Carrier Kit for a SureSeal 25 Millimeter Shaft. This unit comes with one 25MM Lip Seal and 1 Protective Cover that keeps the Lip Seal spinning with the shaft and protects it from damage .. Spare Seal Carrier Kit for a SureSeal 30 Millimeter Shaft. This unit comes with one 30MM Lip Seal and 1 Protective Cover that keeps the Lip Seal spinning with the shaft and protects it from damage .. Spare Seal Carrier Kit for a SureSeal 35 Millimeter Shaft. This unit comes with one 35MM Lip Seal and 1 Protective Cover that keeps the Lip Seal spinning with the shaft and protects it from damage .. Spare Seal Carrier Kit for a SureSeal 40 Millimeter Shaft. This unit comes with one 40MM Lip Seal and 1 Protective Cover that keeps the Lip Seal spinning with the shaft and protects it from damage .. Spare Seal Carrier Kit for a SureSeal 45 Millimeter Shaft. This unit comes with one 45MM Lip Seal and 1 Protective Cover that keeps the Lip Seal spinning with the shaft and protects it from damage .. Spare Seal Carrier Kit for a SureSeal or StrongSeal 50 Millimeter Shaft. This unit comes with two 50MM Lip Seal and 1 Protective Cover that keeps the Lip Seal spinning with the shaft and protects i.. Spare Seal Carrier Kit for a StrongSeal 55 Millimeter Shaft. This unit comes with two 55MM Lip Seal and 1 Protective Cover that keeps the Lip Seal spinning with the shaft and protects it from damag.. 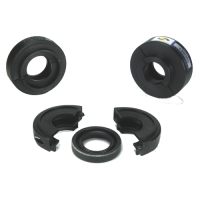 Spare Seal Carrier Kit for a SureSeal or StrongSeal 60 Millimeter Shaft. This unit comes with two 60MM Lip Seal and 1 Protective Cover that keeps the Lip Seal spinning with the shaft and protects i.. 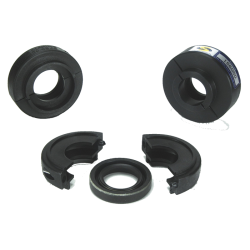 Spare Seal Carrier Kit for a SureSeal or StrongSeal 65 Millimeter Shaft. This unit comes with two 65MM Lip Seal and 1 Protective Cover that keeps the Lip Seal spinning with the shaft and protects i.. Spare Seal Carrier Kit for a SureSeal 70 Millimeter Shaft. This unit comes with two 70MM Lip Seals and 1 Protective Cover that keeps the Lip Seal spinning with the shaft and protects it from damage.. Spare Seal Carrier Kit for a SureSeal 75 Millimeter Shaft. This unit comes with two 75MM Lip Seals and 1 Protective Cover that keeps the Lip Seal spinning with the shaft and protects it from damage.. Spare Seal Carrier Kit for a SureSeal or StrongSeal 80 Millimeter Shaft. This unit comes with one 80MM Lip Seal and 1 Protective Cover that keeps the Lip Seal spinning with the shaft and protects i.. Spare Seal Carrier Kit for a SureSeal or StrongSeal 85 Millimeter Shaft. This unit comes with one 85MM Lip Seal and 1 Protective Cover that keeps the Lip Seal spinning with the shaft and protects i.. Spare Seal Carrier Kit for a SureSeal 90 Millimeter Shaft. This unit comes with two 90MM Lip Seals and 1 Protective Cover that keeps the Lip Seal spinning with the shaft and protects it from damage.. Spare Seal Carrier Kit for a SureSeal or StrongSeal 95 Millimeter Shaft. This unit comes with two 3 3/4" Lip Seals and 1 Protective Cover that keeps the Lip Seals spinning with the shaft and protec..